High stakes: will the Congressionals be the end for Trump? 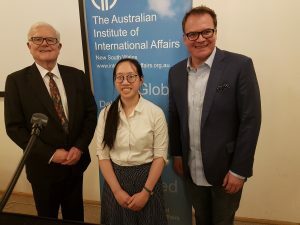 On Tuesday 2 October the Institute welcomed John Barron, host of the ABC program Planet America and an expert on US affairs, to speak about the upcoming US mid-term elections. He explored the range of possible outcomes and the effect of the Congressionals next month on Trump’s ability to govern and on the presidential election in 2020. Mr Barron pointed out that historically the US mid-terms are usually anti-incumbent and the party of the president usually suffer a major backlash in their first mid-term elections. Therefore, the Republicans would be likely to lose seats in these mid-term congressionals, particularly in the House of Representatives, whether or not Trump were president. Voter turnout rates for mid-term elections are typically lower than in Presidential elections, and the people who choose to vote are usually more conservative and older. Hence, while mid-term elections usually swing against the incumbent, they also tend to favour the Republicans. In the past, losses during the mid-terms have not necessarily been followed by the President losing the next presidential elections. Trump may face a strong challenge from within the Republican party for renomination for the 2020 Presidential elections because he has continued to disenfranchise many within the Republican party, particularly Republican women. History has shown that when sitting presidents are challenged by their own party they will normally win their party nomination again because of their incumbency, but lose the presidential election. There is a possibility that a significant loss during the mid-terms could re-energise Trump’s conservative base. There may also be some ‘shock fatigue’ with Trump and the public may have become used to his scandals. Any voter concern about his erratic conduct seems still to be outweighed by his popularity with his base, and he could get a second term. At the end of the talk, there were several questions about the effects the non-compulsory voting system will have on the elections. Mr Barron explained that suppressing voter turnout for the other side is just as important as gaining the vote for your own party. He expressed concern about unscrupulous tactics that are used to discourage demographics such as racial minorities and non-home owners from voting, and he argued that the Democrats need to think about how they can reignite the excitement among the new demographics (such as college students) that Obama generated.